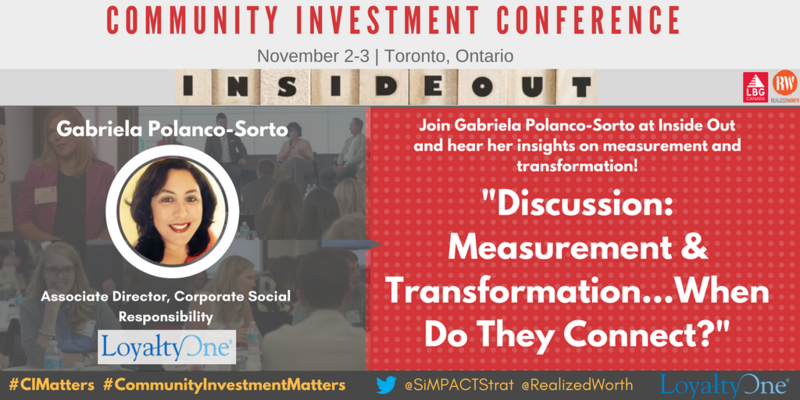 TORONTO, October 26, 2017 /3BL Media/ - Gabriela Polanco-Sorto, the Associate Director of Corporate Social Responsbility at LoyaltyOne, will share recent experience relaunching a community investment program specifically designed to engage employees at the Toronto conference Inside Out: A Transformative Approach to Community Investment. Her remarks will specifically address how thinking 'measurement' at the design stage enhanced overall program design. Inside Out is a future-looking conference designed to advance the practice of how companies invest in community. As many companies today are seeking ROI through community investment, participants of the conference will have the opportunity to explore how business priorities such as diversity and inclusion, employee wellness, and employee engagement can be advanced through community investment. Inside Out will emphasize the skills and knowledge needed to achieve impact: in community, upon employees, and ultimately throughout the entirety of their companies or organizations. "Inside Out is designed for companies seeking to impact community," says Stephanie Robertson, CEO & Founder of SiMPACT Strategy Group. "This way of thinking encourages companies to focus the skills, talents and ambitions of employees on opportunities that have greater community impact. Thinking about measurement is essential for companies to experience success." In 2016, Polanco-Sorto received clear direction to relaunch LoyaltyOne’s community strategy such that it achieved community impact objectives and engaged employees. While the ideal end result was identified up front, community partners were invited to bring forward ideas on how their work could contribute to achieving LoyaltyOne objectives. The end result was a collaborative process that saw new ideas integrated into the LoyaltyOne strategy. "Our CEO shared his vision for our community investment strategy. He asked us to identify a theme for our community investment program, a theme where we could have a real, tangible impact and leverage our associates’ interest and passions," said Gabriela Polanco-Sorto. ‘"We now have a program focused upon community impact and a tangible strategic purpose." Community Investment has a role to play in addressing vital corporate priorities. Join Canadian and international peers on November 2-3, 2017 in Toronto. Think Inside Out.